We manufacture and supply sliding entrance and cantilever gates which are ideal for providing secure access to business premises. 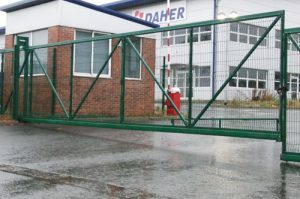 Tracked sliding steel entrance gates and cantilever gates of up to 16 metres per gate leaf and cantilevered sliding gates of up to 12 metres per gate leaf can be supplied throughout the UK. All sliding entrance steel gates can be manufactured in a specification of the customer’s choice and delivered direct to site and offloaded at site by Hiab for easy installation onto pre-prepared, for out steel fencing and steel gate products, foundations.